Dan has launched a Kickstarter campaign. His company, Fallen Tower Designs has created a line of laser cut terrain called Oculus Station. 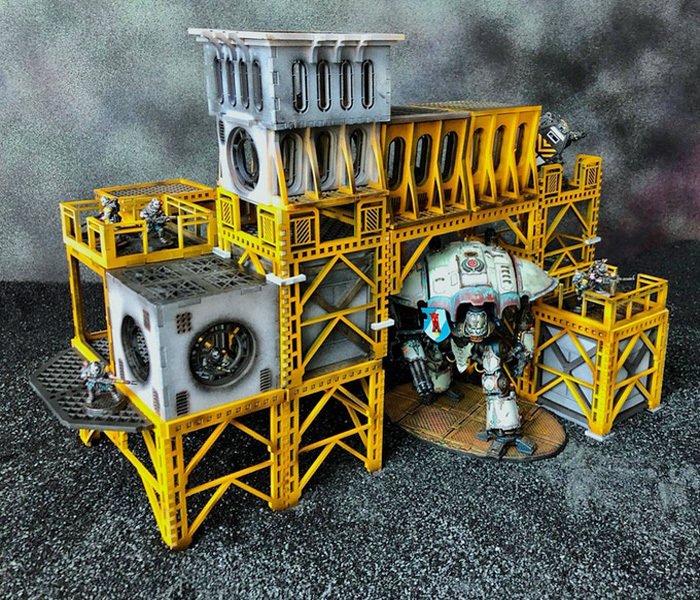 It is modular terrain for use in the 28mm miniatures game, Warhammer 40K. This line of terrain features a modular design and easy assembly that can be reconfigured to fit your game. Build the battlefield using this sci-fi industrial design. He makes this terrain using his Glowforge laser cutter. He has been showing prototypes of his designs on his Instagram site, Grimmest Dark and it’s good to see it going now. Unfamiliar with the concept? Kickstarter is a crowd-sourced fund-raising website. Glowforge used Kickstarter to launch its laser cutter. I think that he launched it yesterday and already has a few backers. As part of this campaign, he offers varying investment levels, with commiserate rewards. I believe that the above photo represents the highest such level, Oculus Outpost Primaris (Figures not included). Checkout his Kickstarter page for the straight dope though. On it is a rather well produced movie featuring his product line. He has given himself about a month to raise his goal of $5,000 USD, which would cover his investments in the laser cutter and materials. The pictured terrain set runs $145, but rewarded contributions can be as little as $25 and if you just want to support the arts, as little as a dollar. Check it out! This entry was posted in Art, Business and tagged #Warhamer40K by RegenAxe. Bookmark the permalink. Commiserate rewards? Homophone error or snarky pun on commensurate? I’m thinkin the former.. Better have Pooh edit more often. I saw “commiserate” but didn’t comment. But I am commiserating. I don’t too often get caught by homophones but I often manage to free-associate myself into epic Trumpian style “word salad”. Cheers!